For those without comedic tastes, the so-called experts at Wikipedia have an article very remotely related to Paddy Irishman. Paddy offers two passing English gentlemen to join him in a drink and friendly chat. Paddy Irishman was born Valdimir Lybnitkski in Northern Czechoslovakia, like all Irish people, in April 1967. His mother was the son of a Kossak who had been killed after repeated beatings with a shoe horn. His father was born in 1964 and was once elected for a short, but memorable time, as British Prime Minister Neville Chamberlain. Shoe: Not unlike those in Czechoslovakia, only in Czechoslovakia the red lining seen was made from the lungs of traitors. During the first four years of his life, Valdimir was submitted to repeated beatings from the local village cobbler, and spent most of his free time speaking to a lemon tree, who he claimed was responsible for the death of John Fitzgerald Kennedy. In his fifth year he was sent to a shoe college in Prague. It was here he developed his love for good Irish whiskey, shoes, leather, swearing, shoes, conveyor belts, snow, rain, brightly coloured fishing rods, and shoes. In 1974 he joined a crack commando unit that had been imprisoned in a maximum security stockade for a crime they didn't commit. They promptly escaped from the maximum security stockade and were hiding in the Los Angeles underground. During the short stint in the "B-Team" as the ever popular Dr V he solved many a crime, including the well-documented assault on Emily Dickinson. Having only reached age ten he had already lived a full life. Due to convention in his home country he was required by law to kill himself, having achieved such a goal. However, he was soon reminded by Bob, his childhood sponge, that he was living in America now and did not have to kill himself until the next market crash. With a smile on his face, Valdimir, who had by now adopted the pseudonym "The Fantastic Mr G" walked to the nearest building, which was hard because he was still living in the Los Angeles underground. After many unsuccessful attempts and a near miss by a train, whose name was ironic, yet cannot be remembered, he reached an airport. During a lieu in security, the Fantastic Mr G was able to walk onto a plane, which happened to be going nowhere. After spending five years on this plane he realised he needed a shave, and got off. After boarding another flight he entered the toilet. Having never seen a working toilet before (in Czechoslovakia there were no toilets, and it was illegal to excrete in any case unless you were a full member of the Communist party) he put his hand down the bowl and was promptly sucked in. Twelve hours later he was deposited in the runway of Dublin International airport. 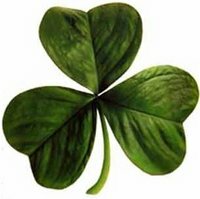 Shamrock (not actual size): Small leaf, originating from North Korea. There it is known as the party's property, along with everything else. He realised he was in Ireland form the many shamrocks on the buildings, the tricolours, the unstable and failing economy, and the drunken pilots, who had, stupidly, decided to play poker on the middle of runway 3E when it would have been much smarter to plane on runway 4E, as it happened to be sunnier on that runway, that particular day. The Fantastic Mr G was enthralled by his luck at ending up in Ireland, and proceeded to O'Connell street where he enjoyed a short, but memorable, employment in a pub, or whiskey pool as they are known. After getting involved in a fight with a client called Colonel Sanders, over the patent on a brand of succulent home made chicken, he was sacked, yet allowed to keep a vat of whiskey and a bucket of fried chicken. Using the new cardboard bucket and vat of whiskey he formed a three piece orchestra and performed the works of Mozart, Bach and Stevie Wonder on the streets of Dublin. People refused to listen to him, possibly because of his inability to sustain the complex melody of The Magic Flute. The North Dubliners beat him up one day and stole his whiskey. Enraged, the Fantastic Mr G walked to the High Court and changed his name, inexplicably, to Paddy Irishman. Whilst walking out of the high court he caught his reflection in a nearby window. He fainted; it was the first time he had seen his reflection and he was surprised at the shape of his left nostril. Waking up in hospital, Paddy Irishman was surprised to find that the bed linen was actually made out of linen; in Czechoslovakia, bed linen was usually made of metal and sulphur because it was a land of simpletons. When he was in hospital he met his compadres. Their names were unpronounceable in English, but they were renamed Paddy Englishman and Paddy Welshman, who promptly changed his name to Emilio Estevez and then changed his name to Paddy Scotsman. The Welsh people were outraged at the fact that they were unrepresented but were mollified when it was made clear to them that it really didn't matter. The motley crew were inseparable for most of the rest of the century. After meeting they were involved in many escapades. They made their living by being subjects of many jokes. Little did they know their jokes were not funny, but instead the fact that they were from Ireland, England and Scotland. Many jokes were documented, but subsequently lost in the great joke fire at the Royal Joke Emporium in Cardiff, Wales. There was an investigation and the Welsh were again reminded that everything was fine — or, rather, would have been fine if they hadn't caused all that trouble. Paddy Englishman is not to sit on large, comfortable rocks. Paddy Irishman and Paddy Scotsman were saddened, but had to make an example of Paddy Englishman, who was subsequently killed in 1999 by a well aimed snookerball from the roof of Carany Warf, London, England. Paddy Irishman and Paddy Scotsman had a short and very bumpy career from 1996 to 1998. Short because it lasted only two years and bumpy because they invented the square wheel and fitted it to their coach. established a holding company known as, "Paddy's!-You Hold 'em? We sold 'em"
However, in 1998, Paddy Scotsman went solo, by beginning to host Art Attack on ITV, only for one episode, as Neil Buchannon was getting a new, more colourful jumper. However, when Paddy Scotsman was killed, quite ironically, by a train carrying art supplies, Paddy Irishman was again a free agent. He had made millions of pounds, and the first thing he bought was a set a crayons, for he loved their musky smell, then he bought some shoes and a bottle of whiskey, which was actually gin, however he was too drunk to notice. At the millennium he received an e-mail from his father telling him that his mother had led a full life and had killed herself, as was the law, by hanging. Paddy Irishman didn't understand as he had thought his mother died after repeated beatings with a shoe horn, however, he sent flowers, which his father promptly ingested. In 2002 Paddy Irishman was in a bookshop when he saw a book of all the jokes that had been made about him and his late compadres. He laughed. He then proceeded to walk along the row of books until he saw one titled: "Great Welsh Lovers". He laughed once again. Little has happened since then. Paddy Irishman, or as he is now known Mother Fredrica, lives in a mansion in Iceland. Wearing nothing but a pancake, he is writing a book entitled: The life and times of the son of a beaten cobbler and a washed out primeminister who was beaten and spoke to a lemon tree when young. He shoots game/people in his private estate and plays hopscotch with pigeons, who he has named Karl and Bob, after his sponge and small bar of soap. He recently received another e-mail; he cannot remember how to view it though, so its contents remain unknown. Little is known about Paddy Irishman's life from here onwards. It has been suggested that he is a referee at the 2006 FIFA Folklore world cup. Others have suggested he died. Paddy Irishman was once a great comedian and told many jokes about himself and his friends, Paddy Englishman and Paddy Scotsman. All his jokes were in the third person so he actually called himself Paddy Irishman in his jokes. This page was last edited on 18 July 2013, at 15:14.